Saturday, Oct. 20 — Papa’s Final Day for 2012 Is Here! 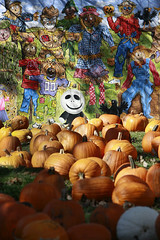 The last day of the 2012 season at Papa’s Pumpkin Patch is here. 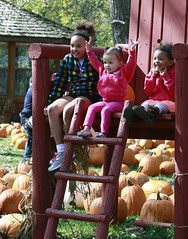 Saturday, Oct. 20 is the final day, and it’s more about fun and being outdoors than pumpkins to be sure. Our 30th year has been an amazing one. 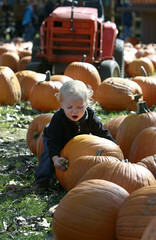 We sold out of pumpkins last Sunday and were able to haul another 10,000 pounds of pumpkins in Monday morning. Today, our final day, there aren’t many left. More than just the one in this photo of Pumpkin and Patch but we are certain to sell out again today. Papa also has some (not much) left for gourds and squash. Also a few straw bales. We are sold out of decorative corn and corn stalk bundles. There are still some gorgeous fall items in the gift store. So what is there to do at Papa’s today? Well, it’s a Saturday which means the “extras” are open. That includes concessions from Ehrmantraut’s Academy, the zip lines, the sling shots, the monster train ride and Sebastian’s train ride, the pony rides and the horse-drawn hayrides. Each of these activities has a small fee ranging from $1/ride to $4/ride. 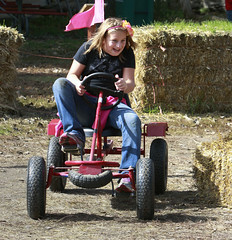 The extras are in addition to all of the free activities, including Papa’sville, Touchstone Nature Trail, Log Jam, big bale obstacles, Special Olympics Trebuchet, Pumpkin Cannon, five Bale Mazes, Slide Mountain, the Corn Cribs, the Wee Zip Lines, the Corn Maze, and probably a couple of others we can’t remember right now. There’s also the great photo opportunities, including the Great Pumpkin’s Chair, Mr. Antique, How Tall This Fall, Billy Bob the Corn Stalk Horse, two barn scenes, Pumpkin and Patch, Papa’s Pumpkin Patch bench and the giant sunflower. Yep, it might be Papa’s last day but there’s still lots of fun waiting for you and your family. And remember, if you wear your costume to Papa’s today, you’ll get a free pumpkin cookie! We hope you’ll join us! Previous Post Friday, Oct. 19 — WAHOO! Papa’s Is Open!